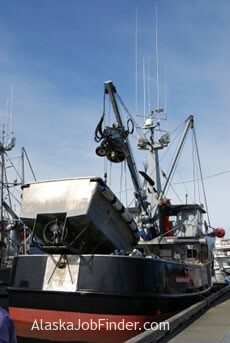 Q: What types of fishing industry jobs are available in Alaska? A: There are opportunities in a variety of different sectors of the fishing industry. We cover them all; from working in a salmon cannery to being a deckhand on a king crab boat. We also have a database of over 2,500 sport fishing charter boats. Most of the processing jobs and many of the deckhand jobs can be done by inexperienced workers. You just need to be a healthy, able-bodied adult and be willing to work hard. Q: Do employers provide free room and board? What about transportation? A: It depends on where you work. In general, if you are working as a deckhand or on an offshore processing vessel, you will be provided with room and board. If you are working at an onshore processing plant, then it depends on a number of factors. In most cases, if the facility is located in a remote area, you will be provided room and board for free or at a highly subsidized rate. If the processing plant is located in a town, then it really depends on the company. In the Members Services section we cover the housing policy of each processing plant. Many companies will also help pay for travel from Seattle to Alaska and back after the completion of a work contract. If you gain employment, and it’s at a more remotely located onshore plant, then it’s more likely you may receive free room and board and transportation. Q: What about earnings-what’s realistic for me to expect? A: It’s difficult to predict earnings due to variables such as employers’ compensation policies, the size of the harvest, the market price of fish, and so forth. However, through the use of the Members Service, you’ll learn how workers earn up to $1,000+ per week during the peak season in a processing plant. Working as a deckhand, you can make substantially more if your boat has a good season. But, there is also the risk that you can make less. Due to all of the variables involved, we don’t like to quote estimated deckhand earnings, but every year we are amazed at how much some of the deckhands make. Q: I am not a United States citizen, can I still get a job in Alaska? A: It is very difficult for foreign nationals to gain employment in Alaska, as most of the fishing companies do not provide assistance with work visa issues. Also, in most cases, you will need to provide your own transportation to either Seattle (Washington State) or Alaska depending on the company, which can be expensive. These are two big challenges and thus we generally do not recommend foreign nations pursuing jobs in the Alaska fishing industry. Although we offer very good resources, these are also two areas that we do not assist with. Most companies will also require that you are able to understand basic spoken English. Warning – Please be aware, there are numerous “fraudulent” websites out there that will tell you differently. These companies steal money from foreigners and do not provide jobs as they promise. Please don’t be a victim of one of these websites. Additionally, we have received numerous reports about companies recruiting employees for work in Alaska in such countries as India and South Africa. It appears that these companies are charging large amounts of money for “guaranteed” jobs in Alaska. Please use extreme caution if you talk to any of these companies. These companies are fraudulent and don’t provide a job as promised. We are not aware of any Alaska companies that have contracts with recruiters outside the United States. Q: I am an employer and I would like to know more about the visa process for hiring foreign nationals? For those hired, the time it takes varies from several days to several months. The process for getting a harvesting job is very different than that for a processing job. Possibilities include writing or calling ahead, hooking up with a boat in Seattle or the boat owner in a town near you during the off-season, or just showing up in an Alaska town and following the strategy outlined in the Members Section. Your job hunting tactics will vary depending on what type of work you’re looking for and the time of year. A: Companies hire in summer, in winter, and year-round, depending on the fishery and the type of work. Thousands of workers spend their summers processing during the salmon peak, while others head North in winter for the harvesting and processing of groundfish. Still others work year-round or ten months out of the year. A worker’s schedule will depend on availability and the type of work they seek. Offshore processing employment contracts generally range anywhere from three to six months. A summer onshore processor’s average contract is two to three (depending on the region) months. Employment can be abandoned anytime after signing a contract, but expect to lose some potential benefits (such as room and board coverage, return transportation reimbursement, and end of season bonuses). Q: Will I know if I have a job before I leave for Alaska? A: Many employers pre-hire, attempting to hire most of the workers before the season. In our Members Section it explains how to apply in advance or apply as a walk-in at the facility in Alaska. We provide information on getting a job in each of the different fisheries and any of the five fishing regions in Alaska; you choose the best option and pursue that avenue. Q: How old do you need to be to work up in Alaska? A: Although legally 16 year olds can work many of the positions in Alaska’s fishing industry, we generally recommend people wait until they are 18 years or older. There is no maximum age, as long as you are physically fit and can perform the work. A: Different species of fish are caught and processed in different areas. We divide up the territory into five distinct fishery regions, each with its own peak season and living and working opportunities: Southeast Alaska, Prince William Sound and Kenai Peninsula, Kodiak Island, Alaska Peninsula and Aleutian Islands, and the Bristol Bay area. Using the information provided for each region, potential applicants can evaluate not only the type of work, but the cost of getting to the work site, the local climate, and living conditions. Plus it’s nice to consider the proximity to desirable travel destinations (for after the season!). A: Some do and some don’t. Workers with longer contracts may have insurance; this depends on the company’s policy. Most seasonal workers will not receive company health insurance but have coverage through Labor & Industries laws (i.e. worker’s comp). Q: Do you have to be a student in order to get a job? A: Absolutely not, but students looking for employment like to work in Alaska because of the months of operation (summer) and the wonderful experience it provides. Alaska fishery workers come from a variety of different age groups, states (and countries), and ethnicities. Q: What if I don’t have any experience in this type of work? A: Most processing jobs, about 75 percent of ship based and shore based processing jobs require no previous experience. On the other hand, skippers usually prefer to hire experienced deckhands, but lots of individuals with no prior experience get hired because they are able to convince the skipper that they are good hard workers and would make a good addition to the crew. In the Member Services section, we teach you the best strategies to land a job as a deckhand. Q: What makes the information in the Members Services section of AlaskaJobFinder.com better than other information on the internet? A: We have been the leading Alaska fisheries employment research organization for over seventeen years. No other company has the experience that we have in helping people navigate their employment options in Alaska’s fishing industries. Hundreds of industry insiders and experts have played a part in helping us putting our resources together. There simply isn’t any other information available anywhere that is as thorough, up-to-date, and dedicated specifically to help people find employment in Alaska’s fishing industry. Yes, you can find some limited information for free on the internet. But, to maximize your earning potential it is important to understand the fishing industry. The fishing industry is a complex industry, there are a number of different types of fish harvested, types of fishing gear used, different regions with different fish runs, and annual fluctuations. All of this can have a large impact on how much you can make in the Alaska fishing industry. We simplify everything for you and provide you with a strategy to succeed. We don’t charge much for access to our Member Services section; in fact you can test out the service for five days for only $3.95! Q: Can my family go to Alaska with me and will the company pay for their room and board? A: The companies that offer room and board usually don’t make a habit out of subsidizing accommodations for families-only for employees. Sometimes families can find independent housing in the town they are working in, but the costs will usually be the responsibility of the employee. A: While still largely a male-dominated industry, fish harvesting and processing employs a considerable number of female workers. Especially at onshore and offshore processors, women are very much a part of the work force. The number of women deckhands is increasing every year. There are even a number of woman-owned and operated harvesting boats. According to the most recent numbers from the Alaska Department of Labor and Workforce Development, women account for about 14 percent of commercial fishermen—both skippers and crew—and about one-third of processing workers. So even though it is not close to a 50%/50% balance, these numbers have been increasing each yet. Here is a good article that was featured in Glamour Magazine: “Women Fishermen in Alaska: “It’s a Small but Incredibly Strong Pocket of Amazing Women Up Here””. Nearly all employers would consider themselves Equal Opportunity Employers (which is the law). Q: Can a friend and I go up and work together? A: It’s common for friends to look together for work in Alaska. If you gain employment, there’s no guarantee that you’ll end up working together every day; it depends on which companies you apply to and their individual employment practices and needs. Q: What taxes do I have to pay when I am working in Alaska? A: Workers in Alaska pay their required Federal taxes like Social Security, Medicare, and regular federal withholdings. Alaska does not have a state income tax. Generally, workers pay the same taxes in Alaska that they pay back home. A: Yes, each year there are a number of office jobs available. Each processing facility has an office. Some people consider these jobs more desirable, others prefer to work in the plant because they often get more overtime hours there. Q: Is coed housing available? A: Sometimes yes. Of the companies that offer housing, some provide for this arrangement, but the majority of accommodations will separate men and women. If workers camp or find their own housing, this obviously won’t be an issue. Lots of options are available and it varies from company to company. Q: What types of boats and employers are profiled in your database? Even though we have over 12,000 employers profiled in our database, it is very easy to perform searches in the database to isolate the subset of employers you would like to review or apply to. Q: Is working on a sport fishing charter vessel a good job? A: Yes, working on a sport fishing charter boat can be a great job. Most of the jobs are during the summer, on salmon or halibut charter boats. Deckhands get to meet a lot of interesting people and usually have a decent amount of free time to explore. Sport charter deckhands also can make excellent money. Most deckhands get paid an hourly or daily wage plus tips. Combined it can amount to $150 to $200 or more a day. If you enjoy fishing and have good people skills, this can be a great way to spend your summer. We profile just about every sports charter vessel that operates in Alaska (over 2,500) in the Member Services section. Q: Are there other jobs in Alaska beyond the fishing industry? A: AlaskaJobFinder focuses on the Alaska fishing industry, but our team has expertise on many other seasonal industries as well. For instance, our job board features listings from oil companies, wilderness lodges, airlines, ski resorts, cruise and tour companies. If you’re looking for a seasonal job or just adventurous employment in Alaska then a membership will be a helpful resource. A: Subscription to the Member Services section is very reasonable. We charge $12.95 for 30 days; $29.95 for 90 days and just $49.95 for a full year. We also offer a special five day trial for only $3.95. We offer the trial, because we want to make our service practically risk free. We are fully convinced you will think a membership is an excellent value. If you are even remotely considering spending some time working in one of Alaska’s fishing industries, a subscription to our Members Service is well worth the price. Annual memberships expire 365 days after registration. Annual memberships do not automatically renew. Five day, 30-day and 90-day memberships do automatically renew at 30 day intervals until cancelled by the member. When you are ready to cancel your membership, we make it very easy, simply go to our MEMBERSHIP CANCELLATION PAGE and follow the instructions. The transaction will show up on credit card statements as “JobFinderSites.com – 866-721-6083. After you cancel, you can continue to use your membership until it expires. We do not refund unused portions of memberships. Q: What if I lost or forgot my Username or Password? A: You can retrieve lost or forgotten Usernames and Passwords by going to our Account Management Page and follows the instructions. Q: What if I want to change my Username or Password? A: You can also change your Usernames and Passwords by going to our Account Management Page and follows the instructions. If you have trouble canceling your membership, please go to our MEMBERSHIP CANCELLATION PAGE and follow the instructions. *Please do not send a membership cancellation request by email.